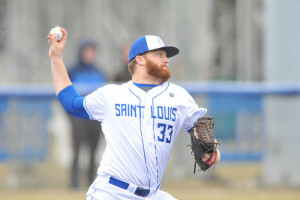 Saint Louis starting pitcher Matt Eckelman threw a complete game four-hitter to lead SLU to a 5-1 win over Dayton in the Atlantic 10 Conference opener. He allowed one run with three strikeouts and two walks. Eckelman threw only 106 pitches in the game. Saint Louis is now 10-12 overall with the win.